Last month, former Eagles wideout Terrell Owens was voted into the Pro Football Hall of Fame. Terrell Owens played in 219 regular season NFL games over his 15-year career. Just 21 of those games came as a member of the Philadelphia Eagles. But, boy, were they special. Mailbag: Could Eagles add Michael Bennett's brother, TE Martellus Bennett? Up until about a month and a half ago, that 2004-05 Eagles team – Owens' first season in Philly – was arguably the most-beloved in recent franchise history. And Owens was a big reason why. In his season and a half with the Birds, which included a trip to the Super Bowl after three consecutive NFC Championship losses, Owens caught 20 touchdowns and posted career bests in receptions per game, touchdowns per game, yards per reception and yards per game. Of course, there was also the Super Bowl itself, a game in which Owens probably shouldn't have been playing in the first place due to a broken leg suffered just two months earlier. The Hall of Fame wideout caught nine passes for 122 yards in the loss to the Patriots despite not being fully medically cleared to play. The end of Owens' time in Philly was full of noise and anger – and distrust all around. But, as is the case with most great relationships, time heals. Perspectives change. And the fans' initial knee-jerk reaction to T.O. 's dismissal from the team can be viewed as just that – an emotional reaction to losing their best chance at returning to the Super Bowl. Nowadays, retired from football and Sharpie-themed touchdown celebrations, T.O. is still putting on a show. He's just trying his hand at a different form of entertainment. Since January 25, Owens has been appearing four nights a week in Las Vegas as part of a live interactive show called "Renegades." Performing alongside the likes of Jose Canseco and Jim McMahon, Owens shares stories from his life and football career before a live Q&A session with the audience inside the 180-seat Cleopatra's Barge at Caesars Palace. The cast of Renegades will change every three months. And since I can't afford a trip to Vegas right now, T.O. was kind enough to take part in a one-on-one Q&A for PhillyVoice to talk about his show, the Eagles, his recent election into the Pro Football Hall of Fame, and much more. Enjoy. 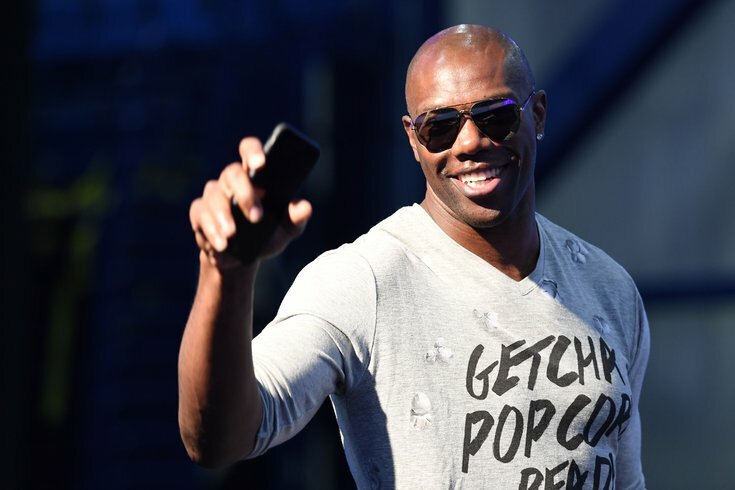 Terrell Owens: The way I explain it to people – when I tell them that I'm doing shows here in Vegas, I think people think I'm doing Chippendale's or something – I just tell them that it's a moderated, kind of up-close-and-personal stage show. It's where we kind of discuss and divulge some untold, unheard stories from our careers. There's a Q&A section of the show where [the audience] gets to ask us questions and nothing's off limits. So it's that kind of show. I've enjoyed it. I find myself just like part of the audience when Jim [McMahon] and Jose [Canseco] are up there. It's been a fun experience, just to kind of learn about these guys and what made their careers and what kind of athletes they are. What's the best story you've heard from any of these guys? I think, just learning from Jose how he kind of got introduced to steroids and how that all came about. I know it's in his book, but I never knew anything about that. I remember that era when PEDs and the whole steroid scandal was being talked about – and some of the guys who are Hall-of-Fame worthy but aren't in there just because of speculation. But just learning that they weren't 'illegal' until people got caught, and that's what's so unfortunate about these guys who have put up great numbers and who are Hall-of-Fame worthy that aren't in there. Then when you talk about Jim McMahon – I think we all have a lot of commonalities with our careers, that we put our careers on the line, played hurt, sacrificed our bodies and being away from families. Being around a guy that played with probably one of the greatest running backs of all time. People talk about O.J. [Simpson] or Jim Brown, but within the first five names, you're going to get to Walter Payton. So to hear the stories about not just how he ran and how he played, but how soft-hearted and soft-spoken he was, how giving he was. They say he was, at least listening to Jim, the ultimate teammate and the ultimate football player. What story do you tell that gets the most reaction from people? It's probably how I came up with my touchdown celebrations. Really, I think a lot of people – especially color commentators or analysts that really didn't know anything about me personally or who I was – they just thought I was showboating when I started to do a lot of the touchdown celebrations. But they didn't know that it stems from when I was in high school. My mom came to one of the few games that she did, and I had made a play or two in that game. I asked her if she saw me make the plays and she didn't know what number I was. And that was really kind of the gist of how I started the touchdown celebrations, because when I got into the pros and finally got drafted, I knew we were going to be on TV and I knew if I scored a touchdown all cameras, all eyes were going to be on me, and there would be no way for my mom to miss me if I kept dancing and celebrating. She would have to know it was me. So that's kind of an interesting fact to know, the reason behind my touchdown celebrations, and I just tried to expand upon it after that. Do you tell any stories specific to your time with the Eagles? I do. A lot of people ask me about the Super Bowl and how I was able to come back from the injury and things of that nature. I explain the spiritual aspect of it, my faith in god and ability to come back when everybody thought it was impossible. So, again, I share some insight into that. OK, so, how the hell were you able to do that? It was a lot of hard work throughout my rehab process. The [Eagles'] trainer, Rick Burkholder, obviously put me on an aggressive rehab program, understanding that we pulled off something that nobody thought would be possible, even the doctor that performed my surgery. He didn't even medically clear me. Again, these are things I share during the time that we're on stage, but it took a lot of hard work, manual labor, on our part and also understanding that there's a higher being, and if you put yourself in a situation where you can see yourself doing something, even if it seems impossible, it can be done. Speaking of Eagles, what did you think of their season? You always get the most out of people, and teams, when you're looked at as the underdog. When I played [on the Eagles], I wouldn't say we were underdogs by any means. I think when we played, people expected us to make the Super Bowl as they saw our season unfold. That wasn't the case with the  Eagles – understanding, prior to this season, how guys played, what their standings were last year, the shifting around of different players, guys being traded here and there, the injuries they sustained at certain positions, vital positions. You think of the left tackle, Jason Peters, and some of the guys on defense. And, most notably, the quarterback [Carson Wentz], who got hurt, 14 years later, around the same time [of the season] I did. Obviously, his injury was a little more severe than mine. And think about the backup – Nick Foles, a guy who has been kind of, you know, up-and-down and not a lot of people had a ton of faith in him, playing like an MVP. Again, speaking of faith, I know he's a believer. All those things have an effect, especially when you start to doubt people. And I think these guys realize who they are and didn't listen to any outside noise as far as who commentators or analysts thought was the best or what have you. When you get out on the football field, you know who you are as a person and who you are as a player, and overall collectively as a team, you know what you bring to the table. Those guys believed in themselves. And even with a guy early in his coaching career, it's not often you see a coach winning a Super Bowl in his first couple of years; he's one of a few [to do that]. That just goes to show you the camaraderie and the belief those guys had in themselves. And I guarantee you – I guarantee you – the love of Philly, those fans, inspired those guys to go out there and play. I know they did for me, so I can imagine what those guys felt like going out there on Super Bowl Sunday against the Patriots, knowing that they faced a tough task. But they didn't back down; they embraced that underdog role. And it showed. I'm sure you were hoping to see them get some revenge against Belichick and Brady, but after seeing how nuts everyone was going in Philly celebrating the Eagles' first Super Bowl title, was there a part of you that was bitter you weren't the one to bring them that joy? No. I definitely wasn't bitter. I do realize the love that Philly fans have for me. When I left Philly [in 2005] after that Super Bowl run, I heard so many rumors that a lot of the fans hated me and that I had caused distractions. I think, over the years, people have started to see that it really wasn't my fault. So I tried to do as much as I could throughout the media to really let fans know that I didn't do everything that the media said I did. I'm not the person that a lot of people said that I was. I think, over the years, people have realized that certain people who presented themselves in certain ways, they weren't always forthcoming. And that was one thing that really kind of bothered me. I didn't want to disappoint the fans who really welcomed me with open arms when I was on the trade block, and I felt like the things we accomplished in Year 1, we could've accomplished again in Year 2. Unfortunately, things got off to a rocky start in training camp, and then coach sent me home. There was a lot of tension and stuff being said about me trying to demand a contract or use some kind of leverage to go negotiate a new contract. A lot of that was false. So, again, I can't be more proud of being able to walk around Philly – or even just out and about anywhere I go and there are Philly fans – and seeing how people come up to me and say, 'A lot of fans still love you. We don't know what you feel or what you think, but they do.' When I left there, I really thought the Philly fans hated me for whatever reason, because of how everything transpired and went down. But now I realize that I have a lot of love in Philly, and a lot of love for Philly. It's just the same on this side, for me. I did whatever I could for the city of Philadelphia and that's why I played and I sacrificed my career – I put it on the line, I literally did that because I wasn't medically cleared to play in that Super Bowl. Every ounce of energy, whatever I had in my body, I put it on the line on Super Bowl Sunday when we played 13 years ago. So I'm so happy for the players that are there and the coaches, like Duce Staley who played there and understands the heartbeat of that team is the city and the fans. It's the people who are there every Sunday watching and supporting that team. And management for making some really hard decisions, as far as making trades and things of that nature, but also finding the players who come in to buy into the culture. Trust me. I watched it. I was here in Vegas, but I wished I could've gone there and made it back in time for my show. I watched [the parade] almost in tears, not because I was bitter, but because I was so happy for the city of Philadelphia. I don't know how many people were there, but it looked like millions – a sea of black and green – when I watched, and I watched all of it. It was pure enjoyment, excitement for Philly. I wish I could've experienced that and had an opportunity to do it myself, but again, I couldn't be happier for that city. Super Bowl weekend was a big one for you for a slightly different reason. You were voted into the Hall of Fame – congratulations, by the way. What does that mean to you? I'm happy and honored to be recognized as one of the greatest to play the game. It's one of the greatest individual honors a player can have, especially if you don't win a Super Bowl. This is the next best thing to that, maybe the best. I say that with all sincerity, when you play the game and make it to the Hall of Fame, all us guys, we share a lot commonalities. There's a lot of sacrifice that went into becoming the player that these guys and myself became. Again, you talk about the sacrifice of what we had to go through to get on the field each Sunday; how fresh you are at the beginning of the season and how beat up you are at the end; how you play through injuries, broken bones, and things of that nature. That's what I did. So while everybody's happy, they're also fed up with the process, understanding that you're allowing guys in that have criminal records or sexual allegations and these things, it really taints and puts a black eye on what the Hall of Fame is supposed to be about. So, for me, you have an opinion about me, and that's why I hadn't gotten in? Because of hearsay? Because one or two guys, a coach or a player here and there, said that I was selfish or a bad teammate, when there's a number of guys that before me, after me, while I'm inducted, whatever, the same thing could've been said about them. I'm happy that it's not a topic of conversation anymore. It's done. It's over with. I'm recognized and no one can ever take that away from me. But something has to change. The process is flawed. Now, being inducted, and understanding all the individuals getting inducted at the same time at the same position, it lets me know it was personal. You shouldn't use personal feelings when you have a system in place with laws and by-laws to nominate and induct players. Again, I'm happy – and my family is happy – and I'm happy because, like I said, of those people who come up to me and say it's long overdue or it should have been done the first time around. Philly obviously left an impression on you. What do you remember most about your time playing and living in then area? Man, just living in Moorestown, N.J., and I remember the first time I had the media all outside my place. It was my second year and Andy [Reid] and I just had a little spat, a disagreement, and he sent me home for the rest of camp. Out in my yard, everybody talks about the sit-ups. That wasn't me trying to showboat or anything. I was just trying to make light of a situation, because they weren't going anywhere – the media was not going anywhere. They were camped out in front of my yard, so at some point they were going to get me coming out [of my house]. I was trying to make light of a situation and I had fun with it; I think a lot of fans remember that. But, for me, just driving to Lincoln Financial Field and being in that sea of green and black and white, it was electric. It was unbelievable. I felt like a superstar. Never in my career had I felt that way, not even in San Francisco. Again, I can't say enough about Andy Reid and how he saw my skillset and talent and was able to get the deal done to bring me to Philadelphia and be able to be put on display like I was every Sunday. But when I scored or made a big play, to hear that stadium – I don't know how many people it holds, but to hear them chanting and singing my name – I wish I could've enjoyed it more. Being who I was, it was hard for me to go out in public and do things of that nature, but had I stayed there longer, I would've been more comfortable going out and getting to know the heart of that city. But I still felt it every Sunday. And I think I showed it, I displayed it, and I think there was a mutual respect. Again, I can't say enough about how much I love Philly and the love is equally shared. Did that make it harder when you felt like Philly fans may not love you back? Trust me, after all these years listening to so many Philly fans, especially after coming back from that injury and playing in the Super Bowl, I think I gained a lot of respect from fans after that. If any Philly fans had any doubt about who I was, not as a player but as a person, I think that removed all doubt, despite any of the things that were said throughout the course of that second year. Obviously, when you play the position the way that I did, I hate that the media gave information to fans and it was things that weren't necessarily true, about trying to get a new contract. It wasn't the way they were reporting it. Maybe it was partially management trying to make me look like the bad guy to put me in a bad light because they knew how passionate the fans were about the Eagles. It was tacky the way they tried to turn it back on me. But, no matter what was being said, I didn't turn my back on Philly; I didn't turn my back on the fans; I didn't turn my back on the players. We understood what was really at stake and what was going on and the truth behind everything. I still went out there and played. I didn't hold out, despite rumors being out there that I was going to hold out. I may have said I was going to, but I knew in my heart there was no way – in business, you do certain things to gain leverage. But I still reported to camp, and reported in shape. I still did whatever I could to help become a better receiver. I tried to help elevate the play of other players and bring my teammates' game to the level where I was. I think a lot of people have heard that through other players, like Brian Westbrook, who's on the record as saying that when I arrived, I helped elevate everyone's game. No matter what the situation was, I wasn't going to let it affect me or deter what I was doing on Sundays. Well, I can tell you for a fact that Eagles fans still have a lot of love for you. My wife just slipped me a note that says, "Before you hang up, you have to tell T.O. that I love him." Renegades is presented Thursdays through Sundays at 8 p.m. at Caesars Palace in Las Vegas. Tickets are $50 for regular admission and $100 for VIP, which includes special seating, a poster and laminate. A meet and greet and photo opportunity with the athletes after the show is available for an additional $100. Tickets can be purchased online at ticketmaster.com. For more information, please visit renegadesshow.com, check out their page Facebook and follow them on Twitter and Instagram.